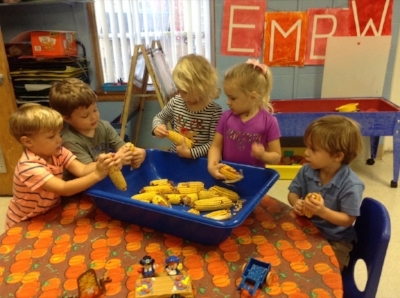 Weekday School is a Christian preschool serving children ages 2 1/2 to 5 years. Our school is known for its committed teaching staff, play-based learning environment, and personalized focus on each child. Small class sizes and a strong network of parent volunteers ensure that the Weekday School is an ideal place for young children to grow and learn. You are smarter than your preschooler. But do you ever feel like he or she is outsmarting you? That even the simplest daily tasks can descend into power struggles? Need a 5 minute warning that play time will be over soon (give warnings). Might be thinking about something else and not hear the request (go close to your child and touch shoulder to be sure you have attention). Might not clearly understand your request (say what to do in very specific and concrete way). Might be used to receiving negative attention (lots of verbal interaction and focused parental attention for negative behavior). Refusing to cooperate gets desired attention. This is HUGE, btw, and can happen in the classroom as well. If you’ve worked through these bullet points consistently, and your preschooler is still saying “no” or ignoring your directions, here are some short phrases to try. The key here is that once you’ve said it, your have to maintain that expectation. Don’t back down. Take a deep breath and wait. You are smarter than your preschooler. “Would you like to choice #1 or choice #2? This is not about whether or not your child has to take a bath, get dressed, or turn off the tv. As the parent, you are setting and maintaining those expectations. This is about giving your preschooler small choices within your stated expectation to unlock a power struggle. It’s one way to let them “have a say” that can encourage them to get moving the desired direction. You are your child’s first and most important teacher and you always will be. Remember that you have to intentionally teach him or her what to do. If you child seems unsure of what is expected or does not understand the direction, follow your direction with, “Let me show you how to do it (said in a gentle tone of voice) and provide your child with the minimal amount of help that he need to do the activity.